Search for help or select a topic using the menu. If you don’t see what you’re looking for, please contact us. Looking for help with PayPal Here Card Reader v.2 ? 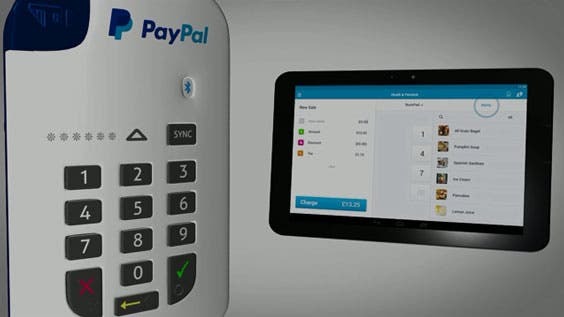 It's easy to get started with PayPal Here, all you'll need is the PayPal Here app, a mobile phone or tablet with 3G or WIFI connection (see below for device compatibility ) and the PayPal Here Chip and PIN card reader. 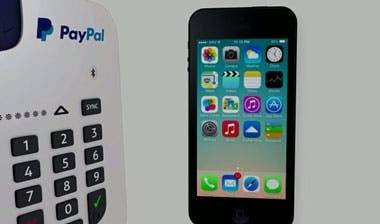 Sign up for PayPal Here online or simply download the free PayPal Here app and set up your account – you can order the card reader at the same time. Please note that PayPal Here is only available for UK residents. Use of the PayPal Here card reader is subject to application approval. See full terms and conditions. 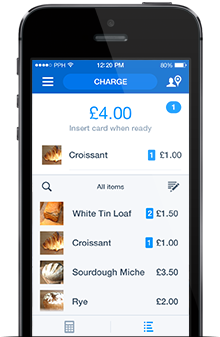 You can order your card reader online now or by tapping the menu icon in your app > Card Readers > Order a New Reader. Once you've purchased the reader, it should take 2-3 working days to arrive. You can return your reader free of charge within 30 days if you’re not satisfied. New readers have a one year warranty period. To set a PIN for mobile number login, go to your PayPal account online, then “Profile & Settings”. Then, in ‘Phone’ settings, choose ‘Update’, and you can set or change your PIN. 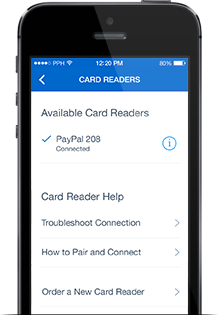 The PayPal Here app is available for iPhone, iPad and selected Android tablets and phones. To process transactions, your device must be connected to the internet via Wi-Fi or by mobile data. Android devices running 4.0 or later, Bluetooth 2.0 (or higher) and support both capturing devices and peripheral card readers via Serial Port profile (SPP). At the moment the card reader is NOT compatible with the following Android devices. PayPal Here is currently not available for Windows devices. Please note that PayPal cannot guarantee that all PayPal Here card reader features will work with all phone models. This is because changes to settings and protocols made by phone manufacturers and mobile carriers are outside of PayPal’s control. The PayPal Here Chip and PIN card reader is an easy to use, quick and secure way to process payments on the go. To switch the card reader on, press the ON/Off (power) button located on the left-hand side of the reader, once. A solid green light indicates it’s on. To switch the card reader off, press and hold the power button for three seconds. Once off, the card reader will not react to any key presses (except the power button). To place the card reader on stand-by mode, first minimise the app, then press the power button once. In stand-by mode, the card reader's power consumption is very low and its Bluetooth connection is off. To wake the card reader from sleep mode, press any key on thekeypad. The card reader will be ready to use within a few seconds. Before using your card reader for the first time, we recommend you charge its battery for at least 3 hours. You can do this by connecting a USB cable from the micro-USB port on the side of the card reader to your computer or any USB plug adaptor. When charging the device by connecting it with a laptop via the USB cable, make sure that the laptop is connected to a power source, otherwise the device will not charge. Step 1 When the reader is connected to the app, you can check its battery by going to the app, tapping the menu icon, then Card Readers. If the battery is 20% charged or less, you will get an alert that your power is low and that you should charge the reader as soon as possible. Step 2 To test the battery level when the card reader is not connected to your mobile device, hold down the cancel button (the yellow arrow) for a few seconds. The PIN lights will indicate the battery level. The number of lights represents the remaining battery power. For example, if the battery is at 50%, 3 of the 6 PIN lights will be on. If the card reader's triangular light is permanently red, the card reader has a low battery and should be charged as soon as possible. When you are not taking payments, save battery by placing the app on standy. When you’re ready to take payments again, open up the app then press any button on the card reader - it should reconnect within seconds. If you are not planning to use the card reader for a while, we recommend you to turn it off. You can turn off the card reader completely by pressing the power button for 5 seconds. Step 1 Go to your mobile device Settings and turn on Bluetooth. You’ll see a list of available Bluetooth devices. Step 2 Turn on the card reader. A green light will blink followed by a rapid flashing Bluetooth light. This process may take a few seconds. Step 3 Select the card reader from the list of available Bluetooth devices. A steady Bluetooth light on the card reader will indicate that it's successfully paired. Step 4 From now on, your card reader will auto-connect to the app whenever you turn it on. TIP: To ensure auto-connect works, make sure the card reader is on and the Bluetooth light is on before you open the app. Go into your Bluetooth settings and remove the card reader from your list. Then run through steps 1-4 again. With PayPal Here, you can offer customers more ways to pay. Accept debit and credit cards. Step 1 Enter the total amount due, and an optional order description. Tap ADD to enter a new item. When the order is complete, insert the card reader, or tap Charge to see the other payment options. 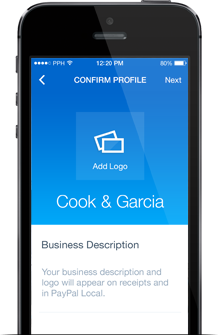 Step 2 To add items from your product list, you can swipe the number pad to the left or tap the product list icon. To review items in your cart, tap the total amount and you will see an itemised list plus any applied tax or discounts. Step 1 Enter the amount per item then tap Enter. When the order is complete, tap Charge. 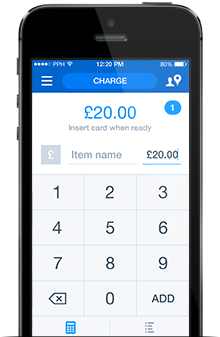 Accept Chip and PIN payments anywhere with your PayPal Here card reader and app. Make sure you’ve paired your card reader with your mobile device and you’re ready to take payments. Step 1 Make sure the card reader is connected. Step 2 When you're happy with the total amount to be paid, firmly insert the customer's card into the bottom of the card reader. Step 3 Your customer can add a tip if you have enabled this option. Step 4 Your customer confirms the amount to pay on the mobile device screen and enters their PIN into the card reader. Step 5 Once the payment has been approved, you can send them a receipt by email or SMS. If you are unsure whether or not a payment has gone through, tap the menu icon then tap Sales Activity. You will see a list of recent transactions, or you can tap Sales History to see older transactions. 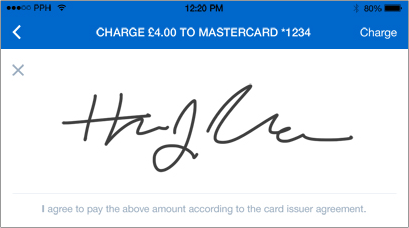 Customers with signature-only cards can make a payment by providing their signature on the screen of your device. Step 3 Your customer can add a tip if you have enabled this option in the app Settings. Step 4 Ask your customer to confirm the amount by signing their name directly on the screen with their finger. Step 5 Once the payment has been approved, you can send them a receipt by email or SMS. You can also add customer information at this point. 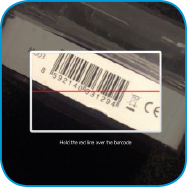 You can add or create new items by using the iPad’s camera to scan barcodes. Step 1 From the Charge screen, tap the Barcode icon. Step 2 Hold the barcode over the red line until it registers. PayPal Here provides an easy way to keep track of any cash or cheque payments your customers make. Step 1 When you're happy with the total amount to be paid, tap Charge. Step 4 Once the payment has been approved, you can send them a receipt by email or SMS. You can also add customer information at this point. Note: PayPal does not process cash or cheque payments - the PayPal Here app only provides a facility for recording your cash or cheque payments. There is no fee for recording these types of payments. You will need to independently process any cheques with your bank. 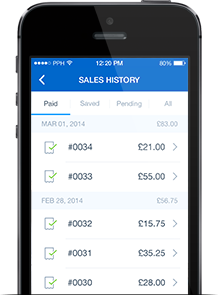 PayPal Here lets you issue invoices straight from the app - anywhere you do business. Step 2 Select Invoice as the payment method. Step 3 Enter the customer's details. Step 4 Select the invoice's due date. Step 5 Tap Send to complete the invoice. 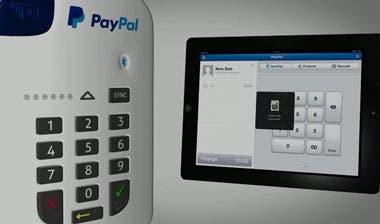 Step 6 Your customer can settle the invoice online at www.paypal.co.uk or with the PayPal Here app. Note: the fees applied depend on how your customer pays the invoice. 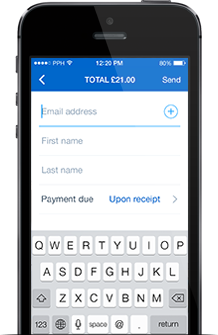 PayPal Here lets you send receipts to your customers by email or SMS for all sales, refunds and cancelled sales. If your customer has lost their receipt, you can easily reissue a receipt at any time. steps 1 Tap the menu icon then tap Sales Activity. Tap Sales History for a complete record of your transactions. [iPad users] Tap the settings icon then tap Sales History. steps 2 Find the transaction you would like to reissue a receipt for and tap it. 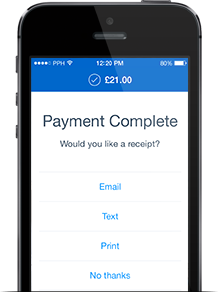 steps 3 Tap Send Receipt to send the customer a receipt by email or SMS. You'll be shown an option to Save customer information. This information will display in your Sales history. You can issue full or partial refunds for any card or PayPal check-in payment. Step 1 [iPhone and Android users] Tap the menu icon in the top left then tap Sales Activity. Tap Sales History for a complete record of your transactions. [iPad users only] Tap the Settings icon then tap Sales History. Step 2 Find and select the transaction you wish to refund. Step 4 Enter the refund amount, and tap Refund. Step 5 If your customer paid with a debit or credit card but the card is not present, you can process the refund without inserting the card. If they do have the card, insert it and follow the steps in the app to complete a card refund. Note that refunds are always made to the original card used. Note: Fees apply to refund transactions where there is an additional PayPal fee. If you plan to offer discounts on any of your products or services, PayPal Here can make the calculations automatically. [For iPhone and Android users] Tap the menu icon then tap Settings and turn Discount ON. Now you can apply a discount to any sale. Step 1 Once you have a total for the sale, tap the amount or drag down the number pad. Step 3 Enter the amount or the percentage that you would like to discount. When you're finished, tap Done. Step 4 The discount will now be reflected in the ﬁnal price.You'll also be able to see the exact amount of the discount. [iPad users only] Tap the Settings icon and turn Discount ON. Now you can apply a discount to any sale by tapping Discount on the cart details screen. 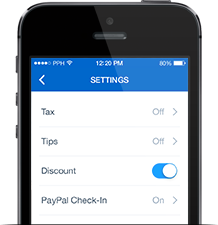 PayPal Here enables you to accept tips as a percentage or a flat amount as part of the payment process. Step 1 Tap the menu icon then tap Settings then Tips. iPad users tap the Settings icon then tap Tips. Step 2 To turn on tips, tap or slide your finger from OFF to ON. 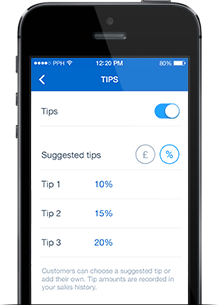 Step 3 You can choose to receive tips by amount or percentage. Step 4 Tap to edit any of the pre-set amounts. Step 5 When you've finished, tap Done. Now when your customers check out, they’ll be prompted to enter a tip before completing payment. Customers can choose a pre-set tip amount or tap Other to specify their own amount. PayPal Here automatically adjusts the purchase total based on the tip amount. You can configure PayPal Here to calculate tax on all sales. Step 1 Tap the menu icon then Settings. iPad users tap the Settings icon. 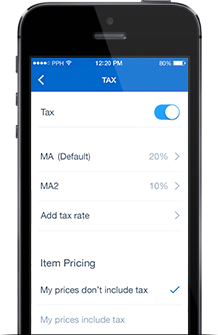 Step 2 On the next screen, tap Tax and turn Tax ON if you wish to set tax rates and automatically calculate tax. Step 3 To set a new tax rate, tap Add New Tax Rate in iOS or the + symbol in Android. Step 4 Give your tax rate a descriptive name, e.g. VAT. If you'll be applying this rate to most sales, tap Set as Default Tax Rate. Step 5 If your tax rate will be added to each item, select Tax will be applied to each item. If the tax rate is included in the prices you charge, select Tax is included in item price. 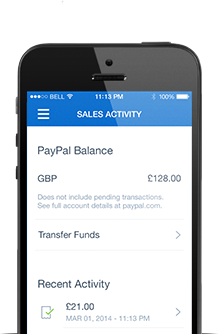 Once you've successfully signed up for PayPal Here, you'll have access to business tools online and in the app. Customise your business profile to control how you want it displayed in receipts and to the public, view your daily sales or run full sales reports at the tap of a button. You can also create sub-users for your business. Basic information about your business appears on your customer receipts and in the "Local" tab of customers' PayPal app. This means potentially thousands of PayPal customers can locate your business from their mobile device and then check-in to pay with PayPal – no cards required. It’s important to add a business logo and to use the correct business name (i.e. not the name of the business owner)and address as these will help your customers find you in their PayPal app. To edit the displayed information, sign in to your account online from a computer and select My Business Details. From there you can edit your business address, URL, email address and phone number. You can also add your VAT Registration Number. Under the Returns Policy section, you have the option to customise the text that will show in your customer reciepts eg. information about your returns policy or opening hours. You can allow multiple users to carry out sales activities on behalf of your PayPal Here account. Step 1 Log in to your PayPal account online. Step 2 Go to “Profile” then “Account Settings”. Step 3 Under "Manage Users", click “Get started”. Step 4 Set the appropriate permissions for your new user. Please note that a card reader can only be paired to one mobile device at any one time. You can use PayPal Here to view your entire sales history on one screen. Step 1 Tap the menu icon, then tap Sales Activity. iPad users tap Sales History. Step 2 Tap Sales History. Step 3 You'll see a list of your sales. The icons will tell you which sales are paid, unpaid, refunded or cancelled. Step 4 Tap any transaction you want to view in full detail. Step 5 When you're finished, tap Back. You can also log in to your PayPal account online to see your sales history and to generate sales reports. Our logos and banners are a great way to let your customers know that you choose PayPal to process their payments. PayPal offers hosted banners, buttons, and payment option graphics that you can use on your homepage and in your checkout. Visit our Logo Centre for branded banner options. PayPal Here is certified by Visa® and MasterCard® and complies with the highest security standards: PCI PTS S-RED 3.0, UKCC, EMV Level 1 and 2. End-to-end encryption and Chip and PIN technology is backed by our world-class risk and fraud management systems, so you and your customers can get on with doing business, knowing that all financial information is handled securely. 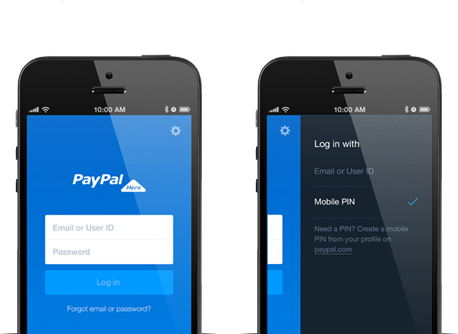 PayPal also delivers one of the most secure payment platforms in the world. Our dedicated team of security specialists monitor your transactions 24 hours a day, 7 days a week, identifying possible suspicious activity and helping protect you from fraudulent transactions. * Calls to the 020 number from a BT landline may be charged at the full national call rate. Calls to the 0800 number are free from a BT landline. Calls from other networks may vary and from mobiles will cost considerably more. Whether it’s in person with PayPal Here, online, by invoice or from eBay, all the money goes to your central PayPal account. Sales made using Chip and PIN or PayPal go into your PayPal account straight away. You can then transfer the funds into your bank account within 2 hours or spend it online direct from your PayPal account*. You can transfer money from your PayPal balance to a bank account linked to your PayPal account (log in at www.paypal.co.uk to link and confirm your bank account if you have not done so already). Step 2 Tap Transfer Funds. Step 3 In the 'From' field, select the PayPal balance from which you want to transfer funds. Step 4 In the 'To' field, enter the destination bank account. Step 5 Enter the amount to be transferred and tap Transfer. Funds are transferred to your bank account normally within 2 hours*. * Sometimes your funds may not be available for immediate withdrawal. This could be due to your account profile, or the types of payments you accept. Please note, as a PayPal Here merchant, you may be subject to an Account Reserve, which is a pool of money set aside in your PayPal account to help ensure that you’re able to meet any liabilities that your business might incur. We will let you know during the sign-up process whether there are any reserves on your account. We'll also send you an email with the specific details of your funds availability, and you'll be able to see these details in your account at any time. Any reserves placed on your account will be dependent on the characteristics of your business or your account. As with all reserves, we regularly review the reserve settings on all affected PayPal Here accounts. When the reserve is no longer necessary, it will be removed. There are no monthly fees or fixed terms with PayPal Here. 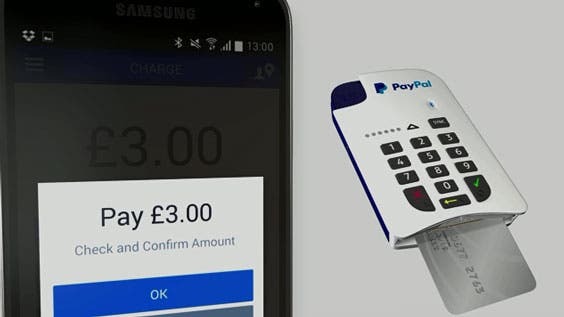 The card reader is a one-off purchase and then you simply pay as you go per transaction.Transaction fees for Chip & PIN and contactless payments start at 2.75% and can drop to as low as 1% based on your total sales volume processed with PayPal. * Blended rate of 3.40% + 20p, or Interchange Plus rate of Interchange + 3.15% + 20p applies for card payments made by swiping the magnetic strip or manually entering the card details. Amex card payments with Chip & Pin, Chip & Signature, and Contactless functionality are always processed with a rate of 2.75%. Amex card payments made by swiping the magnetic stripe or manually entering the card details are always processed with rate of 3.4% + 20p. Additional fees such as cross-border fees may apply. See our terms for details. These fees apply to domestic transactions. If the payer’s card or PayPal account is from outside the UK, our standard cross-border fees also apply. PayPal business account fees apply to all other payments received with PayPal Here. Use of the PayPal Here Card Reader is subject to application approval. Terms and conditions apply. Do I need a internet connection to use PayPal Here? Yes. To process transactions, you must be connected to the internet via Wi-Fi or mobile data. Will my customers need a PayPal account? Your customers won’t need a PayPal account if they want to pay with their debit or credit card, cash or cheque. If they want to use check-in to pay with PayPal, they will need a PayPal account and download the PayPal app to their mobile device. Is there an activation or deactivation fee? No. There is no cancellation process. If you no longer wish to use the product, you can simply delete the app, and the device, if purchased, is yours to keep. Can I use my card reader abroad? No, you have to be in the UK to sign up for and use PayPal Here. Can I accept debit and credit cards from overseas visitors? Yes, as long as they have a supported card: Visa®, MasterCard®, Maestro or American Express. Which cardholder verification methods do we accept? 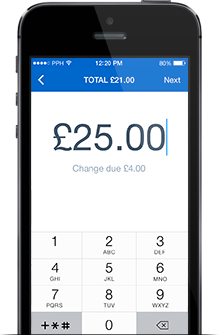 PayPal Here supports Chip and PIN, chip and signature, and swipe and signature. How will I know when the PIN is correct? Why isn’t my card reader working? Your card reader could be idle. Wake it up by pressing any number on the card reader keypad or the power button. If the card reader won’t turn on, connect the USB cable and recharge the battery. Turn off the card reader by holding down the power button then turn it on again. Close and restart the app and then try to reconnect it to the card reader. If you’re still having problems, we recommend you contact Customer Care on 020 8080 6500 or 0800 358 9448 for assistance. Our team will walk you through the steps necessary to reset your card reader. Can I print customer receipts using PayPal Here? 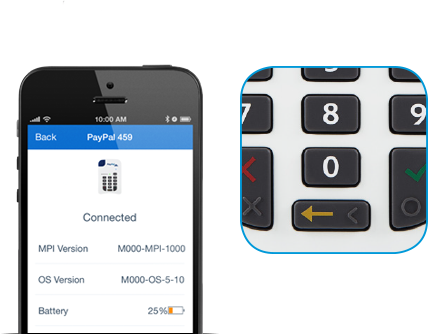 Click here for the latest overview of receipt printers that are supported by PayPal Here. How will I know when the card reader’s battery is low? When the reader is connected to the app, you can check its battery by going to the app, tapping the menu icon, then Card Readers. If the battery is 20% charged or less, you will get an alert that your power is low and that you should charge the reader as soon as possible. To test the battery level when the card reader is not connected to your mobile device, hold down the cancel button (the yellow arrow) for a few seconds. The PIN lights will indicate the battery level. The number of lights represents the remaining battery power. For example, if the battery is at 50%, 3 of the 6 PIN lights will be on. What do I do if my customer's card is declined? Step 1 Check to see if it's an accepted card type (Visa®, MasterCard® and Maestro®). Step 2 If not, ask your customer to try another card. Step 3 Advise your customer to contact their card issuer. What is your returns policy for the card reader? 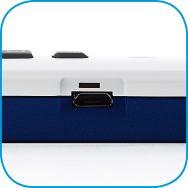 If you wish to return the PayPal Here card reader for any reason, and you purchased it from us either online, through the PayPal Here app or directly from PayPal in person, you may return it within 30 days of receipt of delivery. Make sure it’s undamaged, in good working order and in the original packaging. Contact Customer Service on freephone 0800 358 9448 or 020 8080 6500 for instructions on how to return the item. If you purchased a PayPal Here Card Reader from anyone other than us, please see the returns policy of that retailer. How long is the card reader's warranty period? What happens if my card reader is lost or broken? 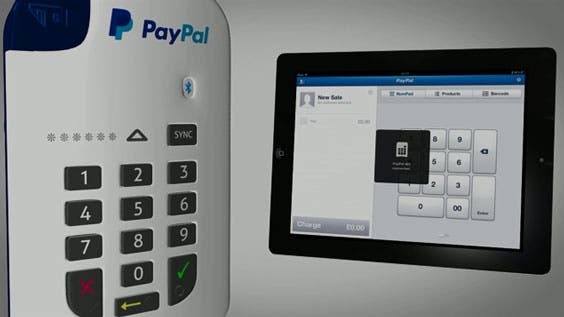 We provide the PayPal Here card reader with a 12-month warranty period. If your card reader is faulty, we’ll replace it for you free of charge. We do not replace lost card readers, but we will be able to disable the card reader remotely. You can then order a replacement online. My PayPal Here application got declined but I have bought a card reader, can I get a refund? Use of the PayPal Here card reader is subject to application approval. 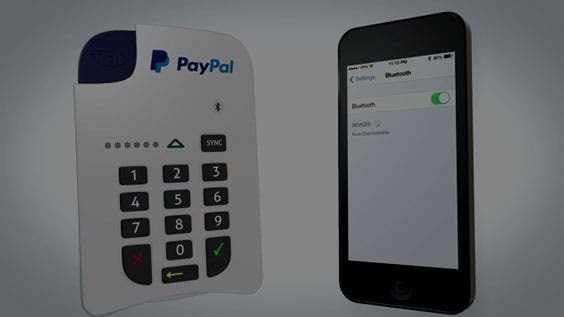 If you purchased a PayPal Here card reader from us either online, through the PayPal Here app or directly from PayPal in person and your application was declined, contact the Customer Care team freephone 0800 358 9448 or 020 8080 6500 for instructions on how to return the item. We will issue you with a full refund once you have returned the card reader. Make sure it’s undamaged, in good working order and in the original packaging. 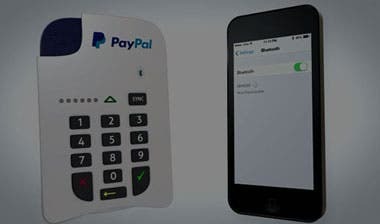 What are level of security does PayPal Here offer? Can PayPal help me with chargebacks? A chargeback happens when a buyer asks their credit card issuer to reverse a transaction that has already cleared. This can mean that a payment you’ve received in your PayPal account could be reversed, even if you’ve already posted the goods. PayPal will help you as much as possible if you wish to dispute a chargeback, although the final decision lies with the credit card company. 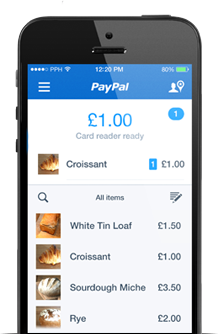 You can call us on 020 8080 6500 or 0800 358 9448 or email us at paypalhere-apps@paypal.com. Alternatively visit the PayPal Here community forum to share your experiences with other users. Calls to the 020 number from a BT landline may be charged at the full national call rate. Calls to the 0800 number are free from a BT landline. Calls from other networks may vary and from mobiles will cost considerably more. Get started with PayPal Here for your business, sign up now. or visit the PayPal Here community support page.